Francois Fillon has said he would drop out of the race for the French presidency if he were criminally investigated. Mr Fillon is at the centre of a media storm over allegations that for years his wife was paid for parliamentary work she did not do. The conservative candidate told French TV there was nothing improper or illegal about his wife's employment. He said he would provide proof but he refused to be tried by the media. 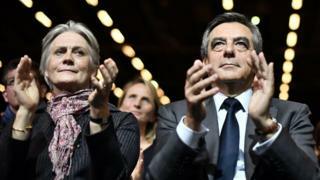 That prompted financial prosecutors to open a preliminary investigation, though Mr Fillon and his wife will only be placed under formal judicial investigation or face charges if prosecutors find there is substance to the claims. Speaking to France's main commercial news programme, TF1, Mr Fillon said he was filing a complaint against Le Canard Enchaine, expressing his "disgust" for the case. He questioned the timing of the claims - pointing out that they relate to a period ending in 2013 - and said they only strengthened his resolve to fight for the French presidency in April and May. "Only one thing would prevent me from being a candidate: it's if my honour was harmed, if I were placed under formal investigation" by a judge. "My wife has been working for me forever, ever since I first got elected in 1981," Mr Fillon told TF1, adding that for most of that time it was for free. That work included correcting speeches, receiving important visitors, and representing him at meetings - work which was "real, legal and perfectly transparent". "The question is why - while my wife had been paid from 1997 - this is coming out now, two-and-a-half months before the election? Clearly this is to try and take me down as a presidential candidate." Mr Fillon's popularity - which had been slipping in recent weeks - has dropped further after the "Penelope-gate" reports were published. According to a widely quoted poll released on Friday, only 38% of respondents had a positive opinion of him, against 54% in November and 42% earlier this month. Before the scandal broke, polls suggested that far-right candidate Marine Le Pen and Mr Fillon were ahead in the presidential race, both with more than 25% support in the first round. In third place was centrist Emmanuel Macron, whose popularity has been rising and now stands at almost 20%. A sharp drop in Mr Fillon's ratings raises the odds on Mr Macron - or another dark horse who might emerge from left field - beating him and making it to a possible second round against Ms Le Pen. In a bid to squash the story quickly, Mr Fillon has instructed his lawyer to provide documents to the prosecutor disproving the claims, but said he would not release anything to the "media court". Commentators say the case has the potential to inflict enormous damage on the candidate who has pitched himself as honest and morally irreproachable. "This affair is a real danger for Francois Fillon and can compromise his campaign because it sows the poison of suspicion about his probity, whereas this marker was his main strength," Yves-Marie Cann, director of political studies at The Elabe Institute, told Le Monde newspaper. "We're in trouble, this is really not helping us," one lawmaker for Mr Fillon's Republicans Party told Reuters news agency on condition of anonymity. Until now, Mrs Fillon, who was born in Wales, had been portrayed as a homemaker in the family's 12th Century chateau near Le Mans, west of Paris. In October she told Le Bien Public newspaper: "Up to now, I have never been involved in the political life of my husband." Mr Fillon is the frontrunner for the presidential election in April, with National Front leader Marine Le Pen and centrist Emmanuel Macron as his main challengers. The 62-year-old right-wing candidate has criticised wasteful public spending and plans to cut 500,000 civil service jobs if elected.